Let me just say, I know it’s been silent here, or rather, I’ve been silent. In my electronic filing cabinet sit about 15 half-started posts and several finished ones that will never see the light of day. Because as much as I try to live authentically, not all stories receive an audience. I write some stories simply to get them out of my body. Stories of heartache and heart break. Stories of anger and agony. Stories about events so raw and unmetabolized, that they must wait in the dark for digestion. And, to answer a question so many folks asked at my readings, yes, I am absolutely authentic, but I have never been tell all. Even the most authentic and vulnerable of writers need space to process their lives out of the public eye. Still. I’m trying to get back on track. So, here you go. This one’s for all of you who have asked so nicely and insistently. The Authenticity Experiment, the book tour edition. Once, a long time ago—when I thought I wanted to be a nature writer in the way that Robert Michael Pyle, or David James Duncan, or Barbara Kingsolver are nature writers—I went to a writers’ conference where two out of the three were teaching. Maybe I was in my late 20s or early 30s, back when everything still appeared possible, and I believed I’d find a way to write about my urban garden and the secret lesbian fertilizer my ex-wife and I made every year, and the city’s nature, and the nature of the city’s character’s, and in that way I’d fuse the genre of journalism and nature writing (Creative Nonfiction a relatively new genre I’d not yet stumbled across). Well, you might imagine how that turned out. My early attempts were dramatic, melodramatic, a writer finding her way across the page. At this conference, Kingsolver mostly told us stories to illustrate the writing life. One of them was about being on book tour for The Poisonwood Bible, which had just been released, and how she’d awakened in the middle of the night in a strange hotel room and needed the bathroom. Confused—was this Cleveland or Cincinnati—she opened the door to her hotel room, stepped into the hallway in only a t-shirt and white nylon mom briefs—then realized her mistake in the too bright light, barefoot on low-pile carpet, right as her hotel room door clicked shut. Kingsolver cried, she said, wept hard in that hallway as much from frustration and the indignity of her situation as from exhaustion. She stood there shivering, I imagine, as she waited for the night manager to come unlock her room. Her point was that book tour seems glamorous to an unpublished writer, but is really grueling—moving city-to-city, bookstore-to-bookstore, never sure whether you’re reading to 2 or 200. At the time all I could think was, “But yeah, book tour!” In fact, I think I still thought that until I started losing my voice right before a podcast interview that ended at the exact time I needed to start driving to Seattle (after having just returned from reading in Bend). And maybe I still thought it even in Port Townsend in the middle of the night after I walked into a towel rack with my cheekbone and gave myself a lovely bruise. Kingsolver’s admonishment didn’t stick entirely. 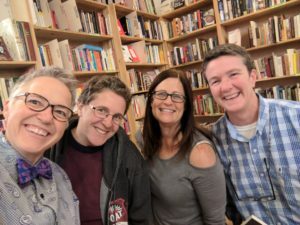 Between September and November, I read in eight cities on the west coast and five times in Portland (it’s a big city and there are a lot of literary series, only two of those readings were part of my launch). I mostly calmed down about audience and sales. I sort of had to. I couldn’t keep worrying if I’d fill the house or sell all the copies of my book, I was making myself crazy. I had to find something else that was a measure of success. Especially after my readings in San Francisco and Oakland. I flew down in the early morning, a day after the fires began, sitting in the window seat on the right side of the plane so I could see the fires. I’ve flown this route so many times. Really, it’s not an exaggeration to say that I’ve flown this route 100 times in the 30 years I’ve lived in Portland. I know when the plane crosses out of Oregon and into Northern California just by watching the landscape change. And on this first flight down, I could see the fires, the fires that destroyed 3,800 houses in a morning. The fires that forced evacuation of all my chosen family, some of them waiting for an hour on the road, hoping the fire would burn past them so they could drive out—otherwise, they’d be forced into row boats like their neighbors just an eighth of a mile away. Look at the picture on the right. That’s the text image I woke up to at 5:00 am on October 11. I could see the Lake County fire burning right up to the edge of hill that backed my best friends’ house, the place I had expected to retreat to for some introversion recuperation. 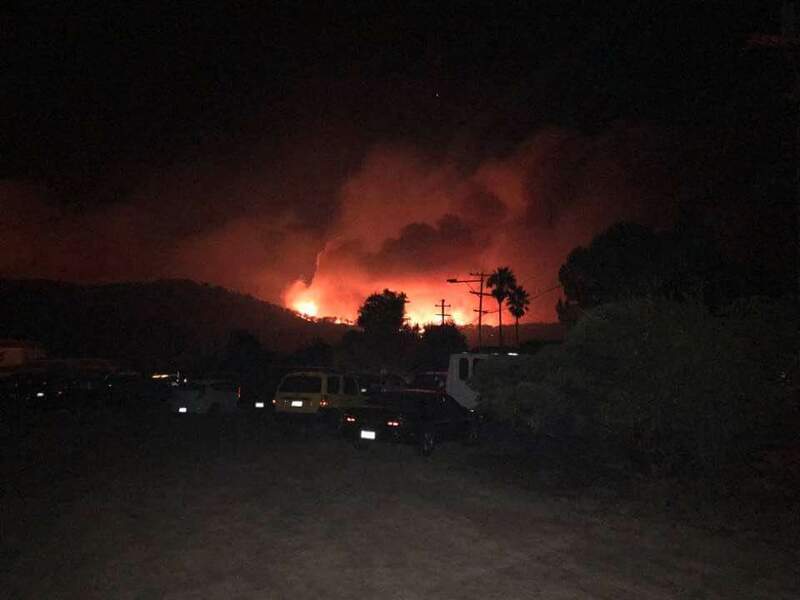 I could see the flames shooting up from trees and hilltops, and I could see the fire lines and back burns smoking in long snaking lines along the bottom of hillsides. In Sonoma County I could see smoke and flames exploding up and out like a dragon surprise, but nothing else as the smoke choked and obscured the ground. And as the plane descended into Oakland, the smoke lay in a brown heavy layer on top of the Bay, so thick I couldn’t see the Bay Bridge, so thick I couldn’t see the water, so thick I only knew we were close to Oakland when I saw the vaguest tip of Treasure Island coming out of the haze. In the face of this, book sales and audience attendance seemed ridiculous. Connecting with family and friends seemed like a better metric while I was there. Hugging my people, crying, laughing, eating meals together, and doing some serious retail therapy for those who left only with important papers and the clothes on their back. For the other cities and my readings in Portland, I decided what mattered most was that the material reach people, resonate with them. If I saw someone crying in the audience, I called the reading a success. I told this all to my friend the Texas Poet. He told me about a poet who gave a reading to three people. At the reading, the poet said to the audience, “How about I read one poem for each of you and then we call it a night?” I imagined he scanned the three people, read their faces, felt their energy, and then picked his poems. It’s often what I do right before I get on stage—choose pieces as I feel out the room. When the poet returned home, his wife asked how the reading went. He shrugged his shoulders and said, “Eh. Okay.” She mentioned that there was a message for him on the answering machine. He listened to the message, it was the Noble Committee relaying that he’d won the Noble Prize for Writing. That poet? Czesław Miłosz, the Polish Lithuanian writer who wrote under communism and was ultimately exiled. I mean, if a Nobel Laureate garners an audience of three, it gives some perspective about literature and public readings, don’t you think? I’m not reading again until February 5th, when you can catch me and Kate Gray—Portland’s literary community calls us “The Kates”—at Grief Rites, which seems appropriate in light of all this. In the meantime, I’m working on some hot messes of essays that may—or may not—see the light of day. But I promise to try and show up here more regularly. It’s almost solstice, the high-holy holiday we celebrate in my house. 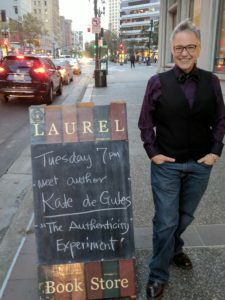 And as a gift to you all, I’m offering signed copies of The Authenticity Experiment at the bargain price of $12 (plus shipping). Or buy both The Authenticity Experiment and Objects for only $25 (plus shipping) and save $8 off retail. Navigate your way to my website and have a literate holiday. Nice to hear from you, Kate. Always enjoy spending my lunch time with you. Thank you for sharing with us again! Well, I have been one of those folks listening intently in the audience on more than one occasion, tears bubbling up as you read. So I guess you will have to accept that you are a success. Glad you are back. I can’t imagine the experience of seeing your home town area in flames and smoke. What a world, what a world. I’ve been reading Objects s this week and wishing to hear you read in person. See you in February (with my favorite writing teacher, no less)! KateCarroll, I enjoy your blog, look forward to reading your books and hope to do another workshop sometime. Lets hope 2018 is less traumatic! With over 2 million miles on American, how many flights in and out of my local airport would that be? And yet I don’t know what the ground looks like. I never look out the window because with luck (and my lifetime Platinum status, which is not YET the style of my hair, I’m a Texan these days after all) I’m in an exit row aisle seat. You remind me to slow down. Look. Listen. Observe. Those are real people, real lives down there. What are they all DOING in those flyover states? I wanted to start my day reading something wonderful and rich, so I came here. While I was reading my computer popped up the notice that today is your birthday! Happy Birthday, you glorious writer! Have a fantastic day… may there be good friends, a bike ride, and cake!